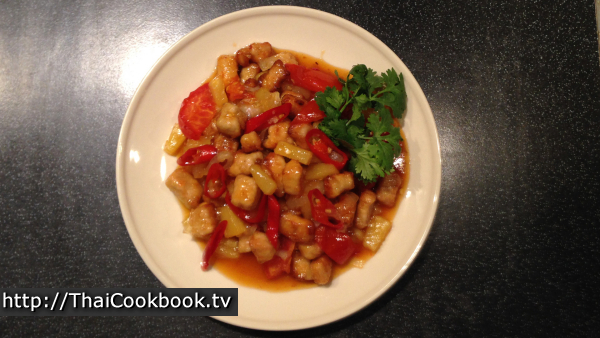 What's in our Sweet and Sour Pork. How we make our Sweet and Sour Pork. 1) Marinate bite-sized pieces of pork loin in condensed milk. 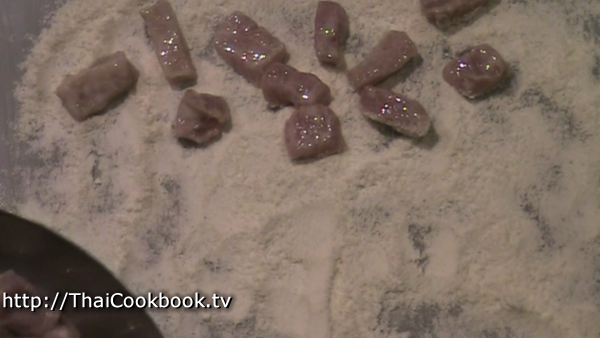 2) Coat the pork in flour to create a light breading. 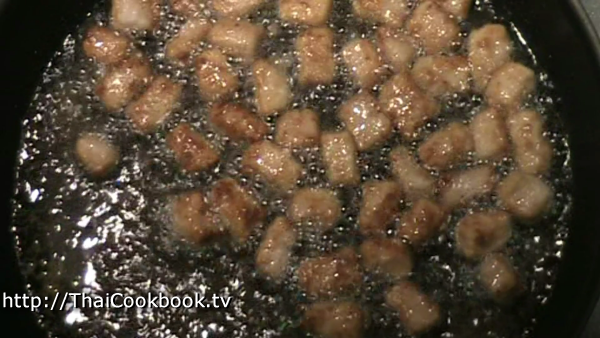 3) Fry the breaded pork in deep oil for 2 minutes. 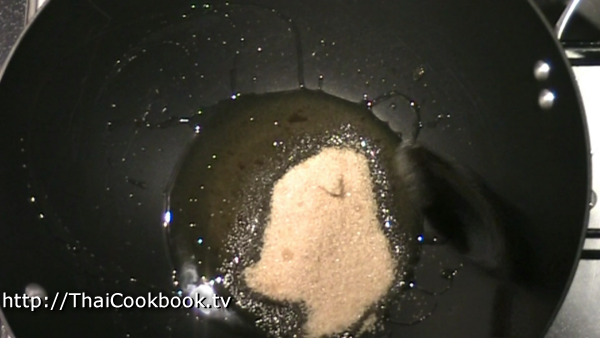 4) Heat the sugar and plum sauce in big wok or frying pan until the sugar melts. 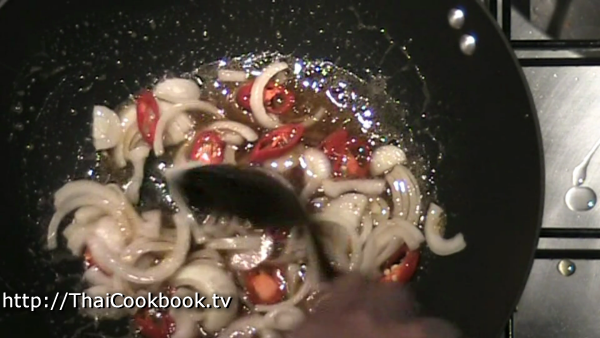 5) Cook the onions and peppers in the sugary sauce. 6) Add the pineapple and cook for 1 minute. 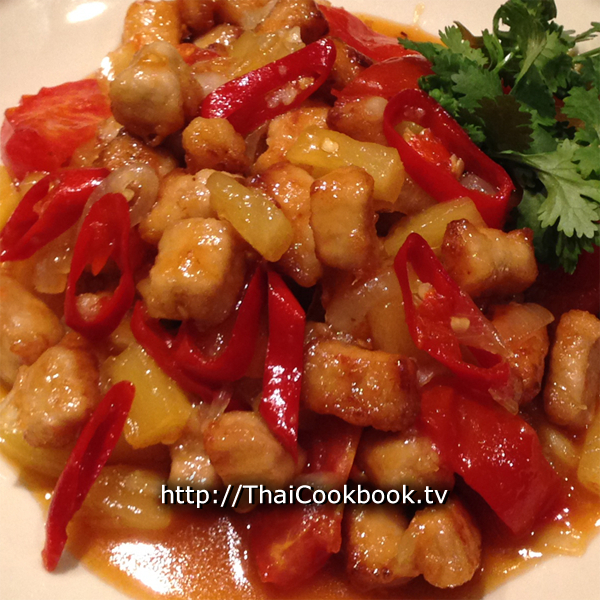 7) Add the deep-fried pork and cook for 5 minutes on low heat until it gets hot and sticky. Turn off the heat, toss in the tomatoes well, then serve. Trim the fat and skin away from the pork loin., then cut the meat into bite-sized cubes. 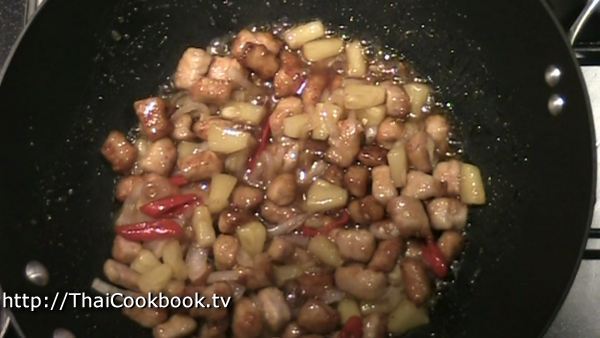 Marinate the pork in condensed milk for 1 hour. 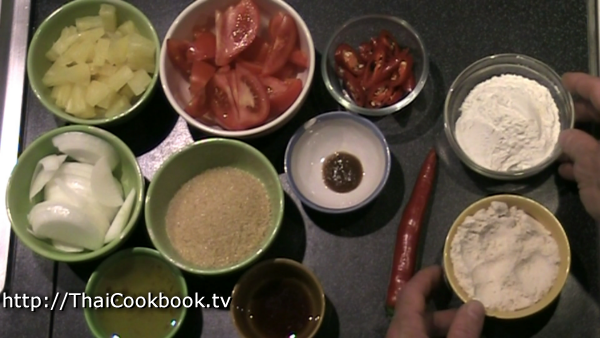 Prepare the ingredients: Cut 2 tomatoes into thick wedges, enough to make about 2 cups. Cut pineapple into small chunks, enough to make about 1 cup. Peel and cut the onion in half, then slice the slice into thick slices. Cut the Thai long chilies on a diagonal. Measure and organize the rest of the ingredients. Fir extra flavor, we use half coconut flour and half all-purpose flour, but you can use regular flour if that's what you have. Stir the pork chunks so they are very wet with the condensed milk, then roll them around in the flour until they are well coated. Fry the breaded meat in deep oil over medium heat for about 2 minutes or until they are barely getting brown so they are still very soft. You do not want them to get hard and crispy. Drain on a wire rack to get all the oil off, or use a paper towel. 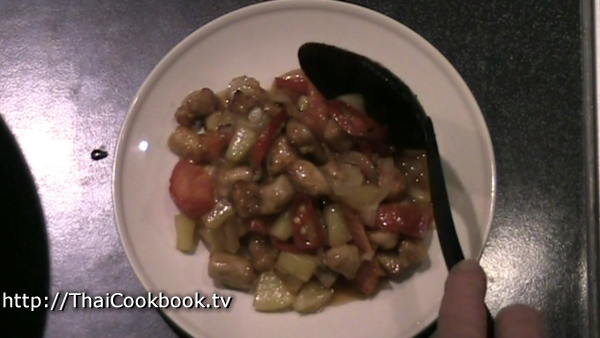 In a clean wok or frying pan, mix the sugar and the plum sauce together and heat on low until the sugar melts. Do not boil or get really hot. Add the red peppers and onions and saute them in the sugary sauce until the onions get a little soft. Add the pineapple to the pan and bring the mixture back to a boil. Add the fried meat to the pan and stir it in well. Let everything get hot and develop into a sweet and sticky pile. Cook slowly over low heat for about 5 minutes, stirring constantly. Turn off the heat and add the tomatoes. 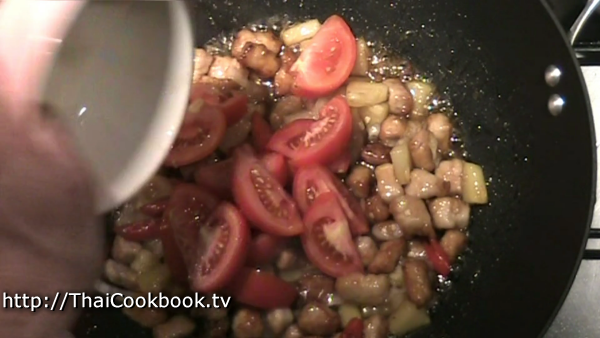 Stir in well and let the pan cool while the tomatoes cook just a little. They will continue to soften up while you serve. Serve on a nice plate to be shared at the dinner table. Garnish with mint, cilantro, or parsley.